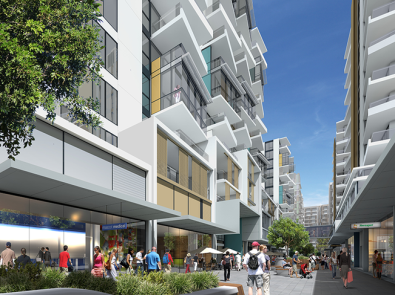 The construction of urban multi-residential apartments demands reliable, robust and durable construction materials and concrete is proving its value and worth in both basement and perimeter walling at Meriton’s construction site at Mascot Central. 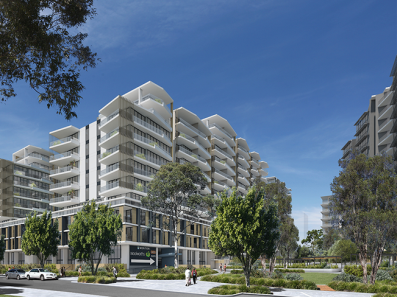 Mascot Central is currently being built next to Sydney’s Mascot suburban train station as a 1,200 plus luxurious apartment community with underground car parking for 2,000 vehicles. 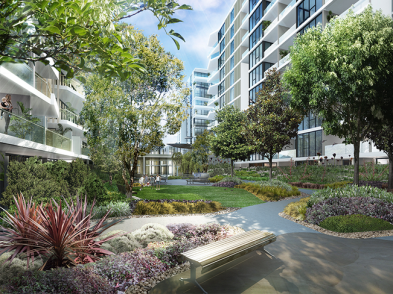 The complex consists of twelve lift cores serving the residentials over twelve floors integrated with a shopping precinct set amongst beautifully landscaped internal plazas creating a complete integrated living community set right in the heart of Sydney. Concrete is central to the vision of its designers providing a sophisticated solution for the construction of the walling both below and above ground. 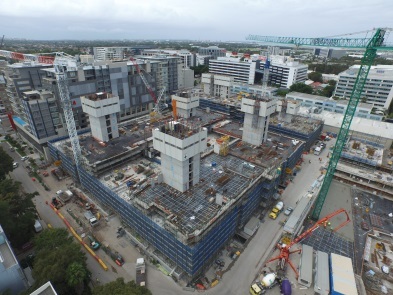 The project is scheduled for completion in 2016. Concrete walls provide the means to create a robust and durable solution for the initial challenging task of excavation and basement construction – this was key to a successful site establishment to pave the way for the remainder of the building construction. 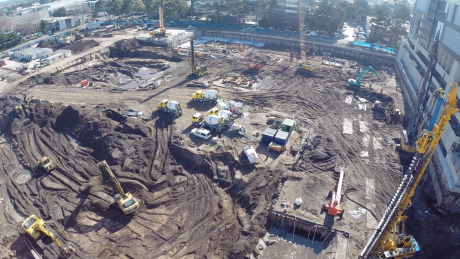 The site is founded in Sydney sand and combined with a high natural water table presented a daunting task for excavation, retaining and waterproofing. After considering various alternatives an ingenious concrete solution was devised using concrete as the basement walling construction medium. 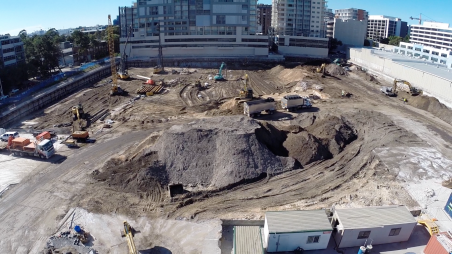 Geotechnical investigations revealed that twenty-four metres below natural ground level the layers of Sydney Sand were underlain by a two metre thick deposit of impermeable clay. As a stroke of building construction brilliance this clay deposit was utilised as a waterproof construction platform by sinking insitu cast concrete piles to form a perimeter concrete wall. The concrete basement walls were socketed into the underlying clay deposit which effectively stopped infiltration coming from the water table leading to de-watering of the basement levels. With the continuous concrete wall formed, the vertical sides of the proposed basement were stabilised which permitted the excavation of the basement area by removing the Sydney Sand enclosed within the perimeter walls. The concrete walls were constructed insitu using a CSM piling rig excavating a 2.4 metre wide wall unit 600 mm thick in the soft sand. The bottom of the excavated pile slot is then injected with premixed concrete slurry progressively filling the slot from the bottom to the top creating a 600 mm thick insitu concrete wall. Another 2.4 m wide wall panel unit is then created adjacent to the first and progressively continues around the perimeter. After closure of the perimeter the sand contained within the captured basement is excavated. The clay floor is then exposed and waterproofed by the use of a continuous bentonite carpet overlain by the bottom basement concrete floor. The basement walls are then stabilised and water proofed by a double bentonite water stop in conjunction with polyurethane injection waterproofing. Concrete provided the solution to a difficult excavation and waterproofing challenge by creating the underground basement quickly and allowing the main construction to proceed. Right from the start concrete is proving its worth and value. Rising from the ground the twelve jump-formed concrete lift cores then create the backbone for a strong and robust building structure. Concrete walls continue to dominate the perimeter walls above ground with a series of precast concrete panels being manufactured by Advanced Precast. The precast concrete wall units are manufactured offsite at Advanced Precast’s factory and transported to site just in time for erection directly on to the building frame. Manufacturing the concrete walls offsite provides a huge bonus to the builder by freeing up storage and construction space on an already busy and congested construction site. The wall panel units are lifted directly from the delivery truck to the final position on the building frame in one seamless and efficient motion. Dowels are set into the substrate and each panel has a corresponding dowel void which is aligned, the bearing is adjusted, panel placed and temporary braces secure its position. The dowel is then grouted and the wall is completed. At Mascot Central, concrete allowed speedy basement construction and robust external wall construction. Concrete walls give the designer flexibility, the builder a fast construction schedule and the owner a strong, durable and robust home. 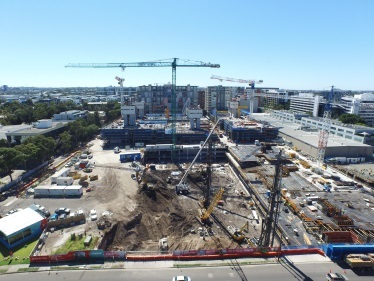 Concrete is delivering value for Meriton at Mascot Central.